Each Halloween, we love hosting trick-or-treaters at our apartment. The way it works in our Upper East Side apartment building is that residents sign up at the front desk to let them know that trick-or-treaters are welcome. A list is then distributed to families, and children who live in the building (and a few friends) come by. The later it gets in the evening, the older - and louder - the visitors get. If you come by, we always give out the good stuff - things like Reese's Peanut Butter Cups. Kit Kats. Snickers. Our next door neighbor does, too, so people always leave our floor feeling very happy and looking like they just won the lottery. The tiniest princesses and superheroes come by with their parents early in the evening. While I ooh and ahh about how adorable they are and admire their costumes, the parents often look warily over my shoulder. Not because there are any ghosts and goblins here - or because Scott looks scary - but because our Christmas tree is usually up. That looks pretty scary to some people, I know. But decorating early gives me time to enjoy the lights on the tree, since I am out traveling on TV tour most of November and December. Early Christmas trees notwithstanding, that doesn't stop us from also decorating a bit for Halloween. I load up on tiny pumpkins and gourds as soon as they appear in September, and keep bowls of them around to decorate through Thanksgiving. Here are a few ideas I am sharing on behalf of several companies on Halloween TV segments this month. There is no reason kids should have all of the fun on Halloween, and it's easy and affordable to stock up for a grown-up gathering! Skeleton and coffin candy dishes, and a spider lace table runner, from Target's Hyde and Eek collection. Exclusive candies from Target. Noticing the peanut butter theme here? That chocolate is a nice match for the smooth finish of Hob Nob's Wicked Red or Wicked Chardonnay. 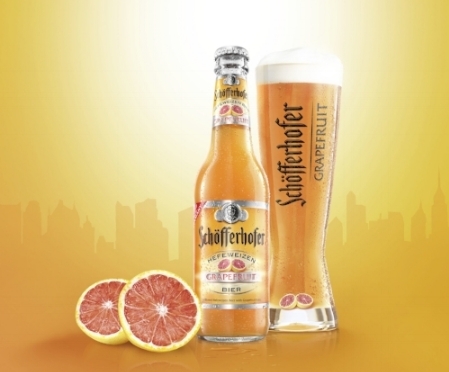 For a refreshing, low alcohol beer, Schofferhofer Grapefruit even fits in with the Halloween decor! I don't need a holiday to brew up a cup of piping hot Pumpkin Spice Coffee or Hot Cocoa on my Keurig. Who says flowers are just for Valentine's Day and Mother's Day? Love these arrangements from Teleflora! When do you put up your holiday tree? * Product photos courtesy of featured companies. Yes, this "Golden Girls" themed cafe in NYC is real. I have soooo many friends who will want to go there. I love our apartment - but wouldn't mind one of these Frank Lloyd Wright homes. You can actually tour this one. And speaking of real estate: beware of tall tales. As someone who hates to drive, it's nice to see more cities developing public transit that enables you to have a car-free or cab-free vacation (or business trip). Seven more Earth-sized planets out there? I don't know about you, but it's always hard to get my head around this sort of thing. I spent much of this week in Arkansas, which like New York, is having weirdly unseasonable warm weather. This has me wanting to do a closet changeover to spring, but I suspect we still have at least a month of winter weather ahead. It's Hollywood's biggest night. I confess that I have seen hardly any of the nominated films and actors this year, so perhaps tonight's ceremony will motivate us to catch up. Can we agree these twins will be simply adorable? One peculiarity of NYC transplants is that we often celebrate our "New Yorkiversary." Yes - that is a real thing! (Google it). Maybe it is because living here is so different from where we came from, or in my case, moving here felt like a lifelong goal achieved. Reading fashion magazines as a little girl growing up in Missouri, and seeing stories of life in this magical city far, far away, I began to imagine myself as a New Yorker - many years before my first visit. So it was that after a few years working on Capitol Hill in Washington, D.C., I finally had an opportunity to move here. When I moved into my apartment on West 72nd Street, the idea of living in Manhattan was both familiar and exciting. I knew I was starting a new adventure in a not-yet-familiar city, and simultaneously I felt as if I had finally moved "home" - even if that home was a tiny 200-square-foot apartment with just a single window, which looked out into the bottom of an air shaft. That Saturday night, I left a light on in that window so that my Mom could watch the SNL opening and know that her little girl was safe at home in the big city - and was doing just fine. As a tourist in the hustle and bustle of Times Square, Rockefeller Center or Wall Street, you might wonder how New Yorkers can stand to live in the middle of all that craziness. This stretch of East 72nd Street is one of the prettiest in the city. It’s a residential block that ends at the East River, so unless you live nearby or visit the tiny park that overlooks the river, you probably won't just happen upon it. If it looks like a movie set, you've probably seen it on film. A bit of trivia for writer friends: for many years, Manhattan’s most famous literary salon was hosted in the apartment of George Plimpton at this address. More literary trivia: Walk about three blocks west on 72nd Street, and you'll come upon Charing Cross House, an apartment house named after the best-selling book 84, Charing Cross Road, penned by a longtime resident, the late Helene Hanff. 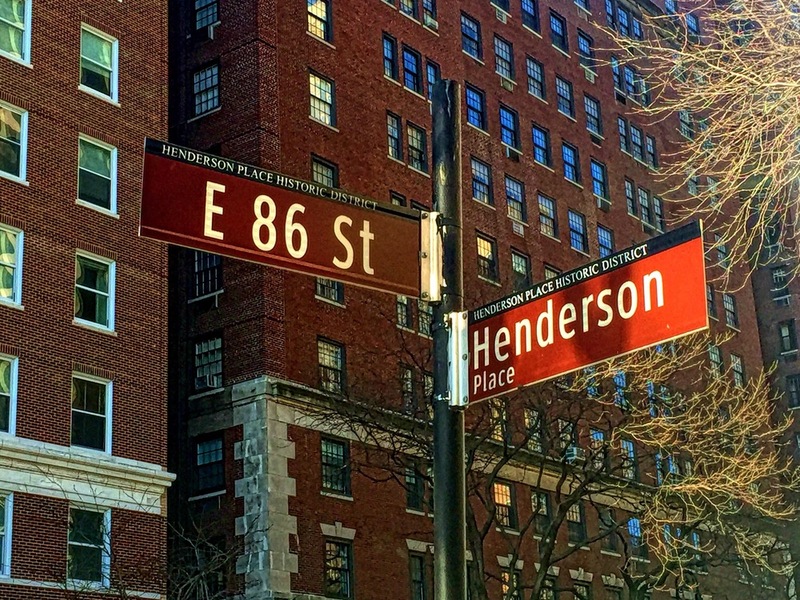 Walk 14 blocks up York Avenue, go one block east on 86th Street, and you'll arrive at Henderson Place. This small complex, which is its very own Historic District, consists of an alley and parts of East 86th, East 87th and East End Avenue. Built in 1883, it is comprised of 24 Queen Anne-style row houses. Henderson Place is only about two blocks from our apartment, and Scott and I often walk by here on our way to Carl Schurz Park - the best Manhattan park you have never heard of. Every once in awhile we'll see a "for sale" sign on one of the homes, but let's just say they are bit out of our price range. Celeb neighbors: Gracie Mansion, the home of New York City's mayor, is in the park across street, and Ricky Martin owns an apartment in the high-rise condo on the right side of the first pic. On the Upper West Side, just west of Broadway on 95th Street, there's a metal gate with a staircase that leads to something that looks interesting - but it's locked and you can't go in. Photos: StreetEasy.com, NewYork.com and ScoutingNY.com - since nosy people like me can't just walk in. This is Pomander Walk, a quaint private community straight out of an English village. Most of the 27 Tudor-style homes face each other across a narrow courtyard, with gated entrances on 94th Street to the south and 95th Street to the north. When I first moved to New York, and spent weekends hunting down locations from my favorite Woody Allen films, this was one of the first spots I found (it has a cameo in "Hannah and Her Sisters"). While many of the houses have been divided up into flats, the trend in recent years has been to convert some of them back into single-family homes. What have I missed here? I'd love to hear about your favorite streets - either in NYC or where you live! “Sure, your only window has a view of a brick wall. In a recent visit with about 100 students from my alma mater on a trip to New York, a few asked me about finding an apartment here. I confirmed that the rumors they have heard are true. What you see on TV sitcoms – 20-somethings with no discernible source of income living in sprawling apartments – is not reality. Sharing a cramped apartment with five or six people? Now we're getting real. Two of my first apartments in the city were "studio" apartments - which in real estate-speak means "no bedroom." Each was about 200 square feet. This was definitely smaller than my college dorm room. I don't have any photos, but even the best panoramic lens couldn’t have captured the limitations of the tiny space. That first apartment was at the bottom of an air shaft. The kitchen was in a tiny closet. It was definitely an apartment for one (although a mouse once briefly moved in…eek). I only got sunshine at high noon - and then only for seven minutes. But the price was right, it was half a block from Central Park and across the street from the Dakota. I walked home from work through the Park, and periodically saw celebrity neighbors like Harrison Ford getting coffee or Yoko Ono picking up dry cleaning. The Macy's Thanksgiving Day parade was just a few steps outside my front door, and 24-hour diners were great "living rooms" for meeting up with friends. Lincoln Center and countless theaters were just a short walk away. I lived there for two years. The view across that air shaft? A brick wall. But on the other side of that wall was New York City.